Don’t Replace, Don’t Reface – Refinish with N-Hance! If you’ve had your wood cabinets for years and want to restore their original life and luster, then it’s time to call the cabinet refinishing experts at N-Hance®. Our refinishing services will restore your cabinets to their previous glory, all for less time and less money than traditional refinishing services. Older cabinets may appear so scuffed and faded that they need to be sanded and refaced, or even replaced with completely new fronts. But with N-Hance, you can easily restore well-worn cabinets to their previous condition, even after years of wear and tear. Unless you want to change your kitchen layout completely, N-Hance’s cabinet refinishing process could be the perfect solution. When updating cabinets, you might be undecided about whether to refinish your cabinets or to have them painted by a team of cabinet painters. Unfortunately, many professional cabinet painters apply a layer or two of paint and call it a day. 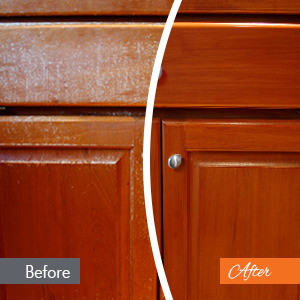 At N-Hance, our cabinet refinishing process does more than just cover up an old look with a new one. Instead, we restore the color and finish of your cabinets to like-new condition, offering a beautiful finish that will last for years to come. Our process starts with cleaning and priming your cabinets, ensuring the best adhesive surface. We then apply a new color, stain, and/or finish to your cabinets, taking care to ensure proper coverage. Unlike traditional cabinet painters, who often leave woodgrain exposed, N-Hance cabinet refinishers offer a solution that will minimize the grain, giving your cabinets a cleaner, on-trend appearance. And while it can take over a week for cabinet painters to complete their work and let it dry, our Lightspeed® process cures the finish immediately! 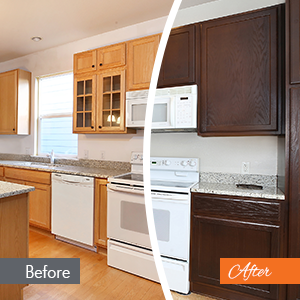 Our classic cabinet refinishing services will revitalize the look of your cabinets with a like-new finish. Our process is faster, safer, and more family-friendly than traditional cabinet refinishing, and comes at a fraction of the cost. Our cabinet color change services are the perfect way to update the look of your kitchen without breaking the bank on a full remodel. We offer an extensive range of finish options for wood cabinet refinishing, making it easy to refresh the look of your kitchen. Transform the appearance of your kitchen cabinets and bring a splash of color to your home with N-Hance custom color finishes. We offer an extensive palette of color options and finishing techniques, so that you can achieve the picture-perfect kitchen of your dreams. Many kitchen cabinet painters offer a limited variety of colors and finishes. N-Hance cabinet refinishers offer hundreds of different cabinet refinishing and recoloring options. This way, you can find the perfect color and finish for your personal style. If you’re feeling overwhelmed by all of these options, we are more than happy to help you choose the color and finish that work best in your kitchen. Before we refinish your cabinets, we will walk you through each step of the process and make sure that you are perfectly satisfied with your selection.